The Fathom Analysis Tools are an interactive and dynamic presentation of your financial and non-financial data. They focus on key business insights such as profitability, cashflow and growth and are a great way to convey these concepts in an intuitive way. We find they work great in a boardroom presentation, a screen-share or even on a tablet over a coffee. If you are looking to create your own customised reports (either for online access or in PDF to send to a client), then we recommend you look into our Reporting. There are a number of helpful tips which will assist you in using the tools in presentations with maximum impact and efficiency. When you have a lot of companies, consolidations & benchmark groups to wrangle in your Fathom account, we know it starts to get harder to operate efficiently. We’ve added a way for you to zip in and out of different companies with ultimate alacrity. Rapidly switch to another company context by searching across all the companies, consolidations & benchmark groups in your organisation. Easily head back to My Companies or access the demo company from anywhere in the Analysis tools. If you have multiple Fathom accounts, you’ll now be able to navigate to the account selection screen, straight from the company switcher. You can access the company finder by clicking the company name in the top left of Fathom. You can also open the company switcher by pressing ‘/’ on your keyboard. The company finder is currently only available in the Analysis tools, but we’ll be rolling it out throughout the rest of Fathom in the coming months. Change from quarter to month view? Download to PDF? Open Presentation Mode? All without touching your mouse. Clicking ‘?’ on your keyboard will bring up the list of available shortcuts. We’ve provided controls to let you quickly pivot to the previous & next period, as well as change the period type (Month, Quarter, Year) that you’re currently viewing. Easily navigate to the next/previous analysis tool with your up & down arrow keys. Download a PDF report of the tool you’re currently viewing (d), or add a series to the trend chart by opening the variable selector (v) without touching your mouse. 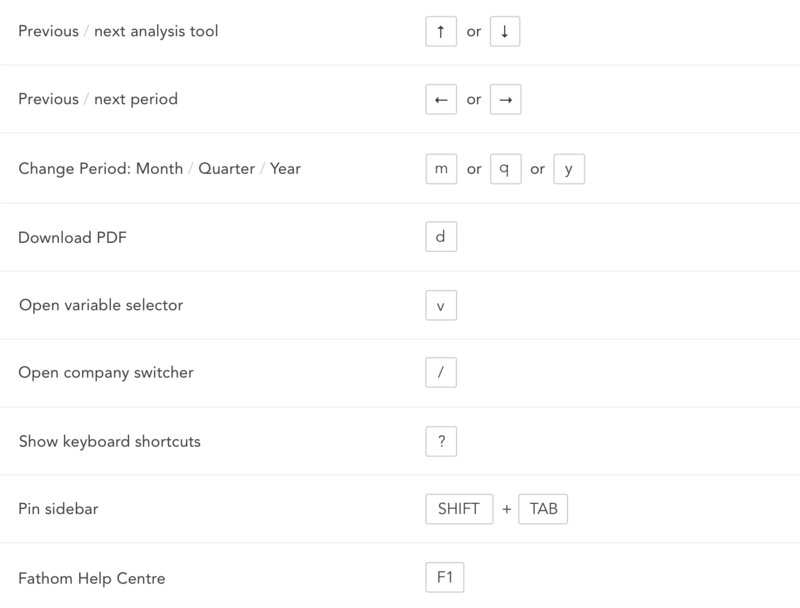 We’ve introduced keyboard shortcuts for common actions in the Analysis tools, but keep your eyes peeled as we start to introduce keyboard shortcuts across other parts of Fathom as well. Navigate with ease, with your keys. In presentation mode, we put the focus on your Analysis tools by removing the app top bar, and expanding your browser to full screen. Presentation mode is great for management meetings with your team, and also great for advisors, when presenting to clients. You can access Presentation Mode quickly by hovering over the tool and selecting ‘Enter Fullscreen’ or by pressing F11 (or Ctrl + Cmd + f on macOS).